Sustainably sourced wood. Make sure that any products made from new timber or virgin timber fibres - from garden chairs to paper and envelopes - carry the Forest Stewardship Council (FSC) label. Biodegradable cleaning products. These have fewer negative impacts on the soil and water system. 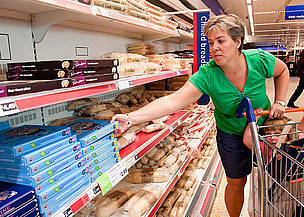 Shopping at a UK supermarket. Product packaging and disposable bags are just a waste – what you really want is the thing inside. Less packaging could reduce what you buy – and immediately throw away – by about 10%. This means less waste in landfills, which release large amounts of methane, a powerful greenhouse gas that contributes to global warming. Buy in bulk.This will reduce the amount of packaging materials you consume. Bring your own bag. Using your own bag instead of the plastic or paper ones given away by stores reduces waste. Some retailers now offer rewards to customers who do not request disposable bags. Why are plastic bags so bad?